Cormac Tienkai Manning is the Green Party candidate in Cork North West at the upcoming general election. Cormac, 23, grew up in Ballincollig, Co. Cork. He attended Scoil Barra and Ballincollig Community School, and recently graduated with a degree in Law and Irish from UCC. He doesn’t come from any political dynasty, but is running for election to help deliver politics for the common good. He has worked in a range of areas, including solicitors’ offices, a coláiste samhraidh, various college societies, and the Northern Ireland Assembly at Stormont. Cormac is currently studying for a postgraduate diploma in Co-operative Organisation, Food Marketing, and Rural Development in UCC. In the Dáil, his first priority would be to ensure a balanced economic recovery which serves all our citizens, not just those at the top. He would also fight hard for practical green measures to improve people’s lives, such as real support for public transport, retrofitting insulation schemes, and community-owned renewable energy. More information on the Green Party and its policies can be found on www.greenparty.ie. 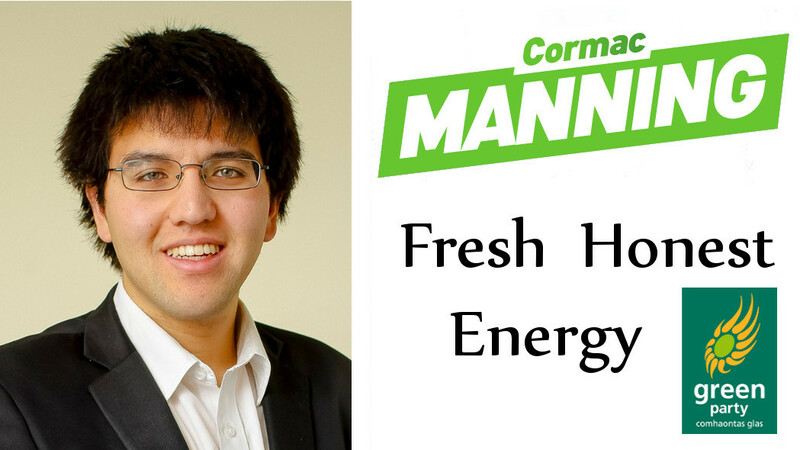 If there’s anything you’d like to discuss, feel free to get in contact at cormacmanning@gmail.com, at 085 1223919 or at facebook.com/VoteCormacManning.